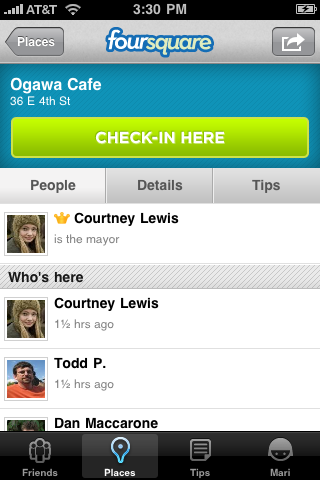 *IS* Foursquare the next big thing? Well that’s what I’ve been trying to work out for myself over the past couple of weeks. The simple answer (from me at least) is: I don’t really know, but quite possibly! Foursquare is a location service-based social network-come-game. What it does in effect is to tell you where your friends are and supposedly add a little fun to going out. It’s like GoogleLattitude meets a little bit of Facebook, a touch of Twitter, and a dash of Angry Birds. The whole system is based around what is known as “checking-in”. You check-in from bars and restaurants and any kind of location (eg bar, club, restaurant, railway station, store), perhaps with a little message about where you are and what you’re doing – all very brief – and the system will then register what you’re up to. People who you’re friends with will then get pinged a message to let them know your whereabouts and activities, and the idea is that they can then join you if they fancy or just be pleased that you’re out having a good time. From the other side of things, if you’re out on your own somewhere, suddenly mateless in town or stuck at home and bored, you can theoretically see where everyone’s at and get yourself down to the party. All pretty simple. The other two things you can do are create a to-do-list of places you’ve always wanted to go and add to a Top 12 list of your recommendations for other people. The clever, or clever-er, part is that you get points for checking-in. The idea is that it encourages you to do so, which then gets the system running and propagates the idea and the ‘fun’ even further. It’s all rather new, even for the developers, and much of the system is still evolving but, at the moment, you get a point for checking in, you get five points if it happens to be from a place you’ve never checked-in from before; a further point if it’s the second, third, fourth etc place of the day; and another still for checking-in multiple days/nights in a row, you old booze hound, you. You’re always eligible for the five discovery points no matter what time of day it is. It seems to be aimed primarily at the evening, painting the town red crowd, but more and more users seem to use it for everyday life too. Like all social networks, just head to the foursquare site and sign up with a free and very brief profile which will ask you for your mobile phone number so it can ping you. Then add a photo and find your friends. And you can get a Foursquare app for your iPhone as well. Foursquare’s very much in the same boat as Twitter was three years ago. The early adopters have started to drink the kool-ade, but for the most part it remains a service completely misunderstood, and even mocked from time to time. But here’s the thing, it is starting to catch on and people are starting to sit up take notice, and actually use it. Foursquare is one of the more practical location-based social networking applications, and it’s value can only truly be gleaned by actually using it. There are also some pretty awesome statistics. In its first twelve months, registered users reached the 1,000,000 mark. But rather more astonishing, its has taken (July 2010) just three months to double that figure. Plus the company behind Foursquare have recently had a cash injection of $26,000,000 from an investor. Clearly someone sees potential for Foursquare. Like I said, the only way you can get your head round new developments like this is to try it out for yourself. So some weeks ago I signed up, and earned myself a badge (Wow! Oh – just for signing up? I see!). I discovered that I could link my Foursquare account to both Facebook and Twitter. Whenever I check into a place an update would be posted to that effect on FB and TW – neat. And so I started checking in to places. It just so happened that I was about to go on holiday to Scotland, so plenty of opportunity to check into lots of new places. And that’s exactly what I did. In terms of updating friends on where I was at, or what I was doing, Foursquare saved me a lot of work! Instead of keying out ‘I’m at Ullapool Ferry Terminal’ and tweeting it, all I had to do was ‘check in’ at the ferry terminal, Foursquare recognising my location, and once I hit the green check-in button, Twitter and Facebook were updated for me. Essentially I didn’t have to type anything. Hey, result! Needless to say I became addicted to the thing. I was checking in left right and centre. And anyone who was following my Facebook or Twitter feed yesterday will testify to that. On a day trip to Sheffield by train I managed to check in at no less than 42 sites, mainly train stations. OK, perhaps a bit on the overkill, but you see I was feeding an addiction (that’s my excuse and I’m sticking to it). What’s in it for a business? I can see how certain types of businesses, typically stores and restaurants, be able to use Foursquare to drive revenue and customer retention. Indeed, the potential is enormous. Foursquare know that I went somewhere, because I checked in. They can pass that data onto that business, who can connect their web advertising, any recommendations, and social media buzz to an actual person who has walked into their store. Many say that that is potentially the holy grail of the advertising world. Does money and effort invested in marketing a brand online, actually drive foot traffic? Does that promotion actually hit the mark? Well, Foursquare knows the answer to that and lots of other things too. Instead of competing in a “global marketplace,” local business owners now have access to geotagging (taking advantage of the GPS technology built into smartphones), local search, and other location-based services. All of which make the Internet more useful to small business than it has ever been before. Imagine being a hotel owner with several rooms as yet unoccupied at 9pm one evening. You know there are a couple of big events happening in town and people are going to be looking for rooms to “sleep it off.” Because of location-based services like Foursquare, they can now advertise a special for those rooms to people who are close enough to take advantage of it. A business could offer a loyalty scheme to customers using Foursquare for Business. It keeps track of all the stats and even sends messages to pinpoint who their most loyal customers are. I was keen to investigate how the Environment Agency might use Foursquare. I’ve struggled, to be honest, to identify a usage. But maybe we could use it a roadshow events, by encouraging Foursquare users to check-in when they visit our stand. Their friends would see that they’d visited us and may feel motivated to come along and find out for themselves what the show is all about. There are quite a number of dependencies there, not least of which is that for it to be fully effective the userbase in the UK would have to be substantially higher than it (probably) is today. So perhaps the original concept is where it will work best? It is aimed primarily at the evening, painting the town red crowd – so bars, clubs, restaurants and the like. I’d be very interested to hear your thoughts about other uses for Foursquare. Perhaps there’s additional scope there that I’ve failed to spot. I’ve been telling corporate folk for ages that reputation management is essential if an organisation joins the Twitterati or Facebook. Microblogging services such as Twitter and an infinite host of other social media platforms have enabled anyone with online access to communicate instantly with a global audience. As such, we now live in a world of billions of potential influencers. One person’s opinions about a company, regardless of whether those opinions are based on evidence, speculation or emotional impulse, can spread within minutes among networks comprising thousands, sometimes even millions, of individuals. Unsubstantiated hearsay about a company can quickly harden into fact – and live on forever, popping up again and again in search engine results. And if those rumors go “viral” – that is, seen and distributed by enough people – it can attract the attention of the mass media, leading to a full blown communications crisis. High-profile examples include Google’s alleged plans to buy Twitter, followed by another stating Apple would acquire the micro-blogging service for $700 million. As we know now, both rumors proved false, but the wild speculation grabbed the attention of the trade media and undoubtedly impacted industry decision-makers around the globe. Whether an online conversation involves something unfounded or true, the worst reaction is to ignore it. Instead, organisations should take a ‘Murphy’s Law’ approach, that is, imagine the worst possible things that can be said about your brand and have a plan for quickly and effectively responding to them. Your senior officers and communications team should create procedures to be followed in case of a crisis. Who within the organisation is designated to respond to rumors? What platforms will they use? Is there a company-wide manual that provides all employees with the dos and don’ts of reacting to online scuttlebutt or inquiries from professional journalists? What are the typical scenarios that the organisation might expect? Do they involve products, services, customer interactions, employee relations, financial markets, industry practices, corporate social responsibility or something else that can impact your stakeholders? For each area, you can develop general messaging that can be quickly tailored to address a specific issue. Make sure those messages are consistent with the core messaging that your company uses in daily communications through all of its channels. The last thing your organisation should do is send mixed messages. Assign one or more employees to monitor online conversations about your organisation. Make sure to have them monitor both mainstream news stories as well as those that appear in social media. These individuals should bring negative conversations to the attention of senior communications strategists who can then determine if next steps are necessary. The beauty of the Internet is that it enables two-way conversations. If, for example, your organisation discovers an unhappy stakeholder on Twitter, invite the individual to speak with you via email, phone or some other channel that will enable you to give them personalised attention and address their concerns in detail. Be humble as an organisation. Show that you’re willing to listen and change. Demonstrating a willingness to learn from mistakes and move forward can generate good will among stakeholders. For example, Motrin, the brand for a popular U.S. pain reliever, launched a new ad campaign implying that mothers use baby carrying devices as a fashion statement. The campaign prompted an immediate, viral protest, with women denouncing the depiction on Twitter and even forming a Facebook group to boycott the product. Motrin, which was closely monitoring social media discussions, immediately pulled the ads and apologised, helping to turn a potentially damaging gaff into an opportunity to engage in a positive conversation with its target audience. Another instance involved a YouTube video of two employees, as a prank, tampering with food at a North Carolina Dominoes restaurant. When the video began spreading on the internet, the company posted its own YouTube video of its president reassuring viewers that appropriate actions had been taken. No, no … don’t duplicate! Following the publication today of a story on the BBC News website technology section that includes a quote from yours truly, I was asked a question via Twitter which I said I would clarify here on my blog for interested parties to learn a little more about my line of thinking. There's much more to potholes than a hole in the road! The questioner (Mash the State) sought clarification over a subsequent Tweet I made that councils should make their own equivalent e-service applications to FixMyStreet or the (sadly now defunct) planningalerts.com, etc., as good as the independent sites. “It’s a short-sighted council that is a bit sniffy about these services,” said John Fox, who helps to monitor the use of websites and social media for Socitm – the professional body for local government IT managers. “They can see these services as a bit of a pain in the neck rather than embracing them,” he said. He added that those behind some of the follow-on services should consider the impact of what they were doing on local councils. “One of the big issues for putting the services on the website is what happens to that information after it has been entered by you, me or a citizen,” said Mr Fox. For instance, he said, when it came to street repairs some councils had created a streamlined system that, once a pothole is reported, routes information electronically so that the only human intervention is a man pouring tar into the offending chasm. By contrast, he said, in some councils a report filed via FixMyStreet may have to be forwarded via e-mail several times before it reaches the right department. Despite this, he said, more and more councils were opening up. Kent County Council has set up the “Pic and Mix” website that allows anyone to take some of its data and play around with it. Some maintained a presence on social sites, such as Facebook, to reach their citizens. Salford, he said, regularly ran an online element to its annual debate about budgets to ensure people are involved with how their council tax is spent. What I said to Mark Ward (BBC correspondent) was that those councils that are a bit sniffy about sites like FixMyStreet are missing a bit of a trick. Many may not have sufficient resources to develop their own integrated online services inhouse, so FixMyStreet provides a zero-cost way of providing online services via an intermediary service and can help to make the council’s own website appear (to the citizen) to offer more transactional capabilities. Good news all round basically. But, where a council has already developed e-services in house, either bespoke or using a proprietary application with a web plug-in (as I write this I can’t for the life of me recall the name of the highways reporting system that is used at Salford), then a considerable investment has already been made by that council in providing online services and it would not be politic to simply ditch that application and switch to the FixMyStreet model. Instead, effort should be put into making sure that the internal e-service is simple and straightforward for both citizen and council to use as possible, to drive take-up whilst reducing overall transactional costs for the authority. So there’s two models. But there’s a third. So let’s assume the council has its own e-service for citizens to report a highway problem, eg a pothole. Just how well used is that e-service? Is take-up e-service good, poor, or non-existent? Maybe the usability is questionable? Maybe it simply takes too long to complete the task? Or maybe the council isn’t marketing its availability effectively enough and citizens are finding FixMyStreet instead? It is highly probable that using FixMyStreet: a) takes less time, b) works every time, and c) has additional customer-oriented functionality for the end user to check out. So if FixMyStreet works better for the citizen than the council’s own e-service equivalent, which isn’t being well used, the council should perhaps be putting effort into getting the internal investment recouped, shouldn’t it? One could argue that in the final analysis, its all about the citizen – provided the citizen ultimately gets the service they’ve requested (ie to have a pothole repaired) it doesn’t really matter, does it, whether the enabler was the council’s internal system or FixMyStreet? Well, actually (sticking my neck out), yes I think it does matter! The council’s internal system will hopefully have been set up to automate as far as possible the internal process, from initial citizen report, to entering the problem report into the highways system and a log number being generated. Then a work order is generated at the highways depot and a man goes out in his little van and fills the pothole in. Meanwhile the citizen gets an automatically generated email thanking him for reporting the pothole, providing a log number and further information on who to contact if he wishes to follow up at a later date. If the system works really well additional customer facilities will be enabled, like informing the customer that the hole has been filled in, or providing details on the website of his problem statement and the subsequent fix. As an aside, in my capacity as a Better connected reviewer, I’d be especially delighted if I received an acknowledgement email that informed me about other online service offerings from that council that I might like to try out sometime. Where FixMyStreet falls down (in comparison to the council’s own e-service) is that the pothole report is sent in an automatically generated email from the owners of FixMyStreet to a nominal contact in the council. For a council that gets a lot of FixMyStreet reports, that’s potentially an awful lot of reports being sent to a single individual. It’s usually one contact per council, they’ll receive not just potholes but also street lights, dead animals, etc., so they’ll have to farm out the reports to the relevant part of the council for action. I know of one council where the contact is the council’s single press officer, he’s a busy man and the potential for messages to get held up, unactioned, in his inbox is not inconsiderable. These factors inevitably impact upon transactional costs because extended time and human interventions are involved in passing the FixMyStreet report to the right department, then it has to be keyed and the work request generated before the highway man pops out with his bucket of tarmac. Essentially, then, the general thrust of my assertion is that the council’s own e-service is likely (if well designed) to reduce overall transaction costs, whereas the FixMyStreet method might work well for the citizen but it doesn’t work terribly well for the council because there’s no back office integration for the problem reporting, and therefore transaction costs will be higher. And so yes there is, I believe, a real benefit in making sure that the council’s own e-services where available work effectively, and where they aren’t available, then promote the FixMyStreets of this world and get your internal processes attuned to handling the enquiries you’ll doubtless generate as a result of doing so! After an early appointment in Oxford (which was kindly rearranged for me) Craig and I will be hitting the M40 at the start of a long drive to Uig on the Isle of Skye, and then we’ll cross to Tarbert, on the Isle of Harris, on Tuesday. We’ll return to the mainland from Lochboisdale, Isle of South Uist, on Saturday afternoon. I’ll be twittering my way around, subject to mobile reception, complete with pictures and location maps. Look in the righthand column on this page for tweets/links, or follow me at twitter.com/x333xxx.